The global construction market will hit $10.3 trillion in 2020, and it’s a field where mistakes are costly: rework typically makes up 12 percent of project costs, reaching tens of millions of dollars on big projects. But augmented reality can change that, which is why construction is one of the first industries starting to explore the use of AR in day-to-day work. For a summary on the state of AR in construction and what’s coming next, I talked to Amir Rubin, founder and CEO of Paracosm. Paracosm offers mobile reality capture for construction teams, and they’ve built both the hardware and the software to power it. (Full disclosure that I’m an investor in Paracosm through my role at the venture capital firm Accomplice). Architecture, engineering, and construction professionals use Building Information Modeling (BIM) to make 3D designs of projects. These BIM models are perfect representations of what the finished project should be. Popular software tools for making BIM models include Autodesk Revit, Graphisoft ARCHICAD, and Bentley Microstation. As construction teams work on the project, comparing the physical work site to the BIM model is a powerful method for catching discrepancies between the two. Today, construction professionals use laser tripod scanners to capture the project site, later comparing the data to the BIM model. Faro and Leica Geosystems offer two of the most popular scanners. Although they’re powerful and precise (down to 1mm or better), these systems are slow: they take 2-4 hours to scan a 20k square foot site, then another few hours in the office to post-process the work site data captured. It adds up to about a half to a whole day to scan a small or medium site, plus a day or two of processing. It’s expensive and time-consuming enough to make it pretty infrequent. One of the most important advances bringing AR into construction projects is Simultaneous Localization And Mapping, or SLAM. SLAM originated in robotics to allow autonomous vehicles to move through environments they’re encountering for the first time. SLAM systems use sensor data, usually through lidar, to track the vehicle’s location and map the space around it. Obviously this process has to happen fast, or else a car moving quickly will be in trouble if it can’t pull in the world and the objects around it. That’s the benefit of SLAM: it works in real time and doesn’t need GPS. Applied to construction, SLAM lets workers walk through a project site and map it in extreme detail in minutes. This 3D reality capture shows exactly what’s happening in the project site, down to about 2cm to 5mm of accuracy. Note that it’s not as accurate as the tripod system’s 1mm, but they’re slow: tripod scans take days; SLAM scans happen in real time. A worker walks through the site holding a lidar sensor. This only takes a few minutes. As she’s walking, she’s creating a highly accurate map of everything on the site that’s uploaded to the cloud. Software in the cloud compares the map she just made of the site to the BIM model, thus comparing the physical reality of the project to date to the desired outcome in the plan. Any mistakes on the site that aren’t in the BIM model stand out, letting crews fix them early. The software also tracks completion of the project, keeping teams up to date on progress, expectations, and costs. Repeat steps 1-4 daily or weekly as the project continues, getting a much better view of how it’s going. This future workflow is Paracosm’s vision. The team started in robotics, spending years building their own 3D mapping software for that field, before realizing that their biggest opportunity was in construction. They then developed their own hardware to pair with their software, employing lidar (which measures distance to an object using laser lights). 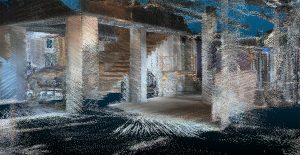 Lidar has gotten much cheaper and more powerful in the past few years because of an explosion in use and development around autonomous vehicles and computer vision. Today, workers can use Paracosm’s scanning hardware to walk through a site and capture accurate 3D data, but eventually, Paracosm wants to automate this scanning with ground robots and then drones. After scanning, Paracosm automatically aligns the coordinate system of the captured data to the project’s BIM model. Once aligned, they can run comparisons with engines like Skur. Then Paracosm’s visualizer provides analytics and insights into how the project is going, whether it’s on spec, and where potential issues could be. Paracosm’s goal today is to make scanning so easy and effortless that crews can do it every day, gaining a tight feedback loop around quality control. Other players are targeting similar uses in the space, like Shapetrace (which uses off the shelf hardware to overlay drawings, BIMs, and models to reduce errors), and GeoSLAM (which makes both hardware and software for capturing and analyzing survey data). The architecture, engineering, and construction fields are likely pioneers of AR. Whereas consumer adoption of AR depends on enough people buying headsets and hardware, construction already has lots of interesting and useful applications for it—and the money to invest in its development. We’ve seen some encouraging projects so far. In June 2016, Microsoft announced a partnership with Trimble, which provides positional technology and 3D modeling, and AECOM, one of the world’s largest engineering firms, to bring HoloLens AR to their projects. The main uses of AR here include holographic displays of BIM models, collaboration among team members, and immersion in construction plans. In a widely-shared proof of concept in August 2016, Scope AR partnered with the drywall subcontractor Martin Bros. to build a bathroom pod using only AR on the HoloLens. The experiment showed that it’s possible to build indoors in a controlled environment without physical building plans or even a tape measure. Instead, workers use a 3D model floating in AR to place each piece. Hackathons focused on VR and AR in construction, like AEC Hackathon, are gaining ground with backing from big companies like Autodesk and events throughout the year across the country. A few early-stage companies offer tools that let users view BIMs in VR, like Iris and VIMtrek, and help designers visualize their projects in more depth than ever before. Once work begins, companies like Scope AR and Daqri allow workers to see and give instructions in AR glasses/helmets or on mobile. These systems are still very new and don’t have widespread usage yet. Other companies target real estate and interior design in VR, focusing more on finished spaces than those undergoing construction. Floored lets users virtually build out and view commercial real estate spaces on top of floor plans. Matterport uses its own 3D camera to capture real estate interiors, which can be used in VR tours or converted to digital models. Navvis is also capturing indoor spaces, letting users scan areas to digitize them, map them, or even convert them into BIM files. Ultimately, construction professionals want a scan so accurate that workers can walk through spaces with an AR headset and view the BIM model on top of them, seeing how progress on top of the site itself. They’d be able to use AR/VR visualization to bridge the gap between the BIM model and the actual building being constructed on the ground. That’s still a ways out, says Rubin, because tracking accuracy is not great enough yet to do the overlay of the BIM in AR. To reach a point where viewing the BIM model on the work site isn’t just a novelty, it needs to be overlayed within an eighth of an inch of accuracy. Otherwise AR elements won’t line up with physical ones, and things will look off. If you’re in construction, pulling AR and VR into your workflow could be your competitive differentiator. We’re still a few years away from the most powerful use cases, but there are already plenty of tools today that expand your toolkit and cut costs.